All of the big players in consulting and analysis have the same message when it comes to corporate mergers and acquisitions (M&A): the failure rate consistently hovers between 70 and 90%. One way to measure success is stock price, but only one third of companies involved in an M&A in 2015 saw their company's stock price rise after the deal. And the stakes have never been higher – in the US alone there was a 60% increase of M&A activity year-over-year and companies are paying record-high valuations for acquisitions. Given these trends, a disconcerting number of companies are poised to experience M&A failure on a major scale. 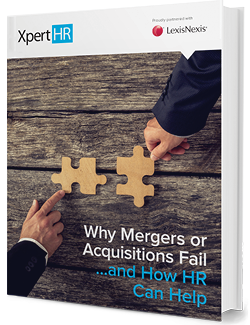 While the failure rate and negative impact of mergers or acquisitions is alarming, it also presents a promising opportunity for senior HR professionals.